It was my dear grandmother who first told me about a recipe in The New York Times for tahini chocolate chip cookies. She had tried them and was raving about them — the golden crunchy edges, the chewy centers, the oozing dark chocolate, the saltiness and discernible nuttiness. I was skeptical and tucked the suggestion away in the recipe box in my head for at least nine months. But after making that beet salad with tahini dressing a couple of weeks back, I had quite a bit of tahini left and was looking for ways to use it up. I remembered the cookies grandma had told me about back in January. I Googled. The recipe had made the internet rounds in 2017, blogged and re-blogged, shared and re-shared by food writers all over. David Lebovitz had made a version that he adapted from somewhere else, not unlike the one in The New York Times, but slightly different, too. This is evolution of recipes in the internet age, after all. (If you want to know about the chocolate chip cookie taking over the interwebs in 2018, look no further than Alison Roman's salted chocolate chunk shortbread, which I've encountered no fewer than 100 times on social media and in print this year). I pored over the comments on the David Lebovitz tahini cookie recipe and started adapting from there. Chocolate chunks in lieu of chocolate morsels are all the rage right now, which incidentally, is how it used to be done before morsels were a thing. Or so I've heard. Take a good bar of dark chocolate (I used Trader Joe's) and chop it with a chef's knife into mismatched shards. You'll get little flecks of chocolate in some bits and big melting pools of chocolate in others. Fair warnings with this recipe: first, the dough needs to be refrigerated before baking. David Lebovitz recommends overnight. I got away with 4 hours for the first batch and didn't notice a significant difference when I made a second batch the next day. Second, these aren't the most beautiful chocolate chip cookies I've ever offered up. They're darker in color and flatter than, say, my fresh mint chocolate chip cookies or the maple pecan chocolate chip cookies in my cookbook. But if you like crunchy edges and chewy centers, this might be just the recipe for you. Finally, the tahini brings a complexity to this cookie that you won't find elsewhere. Many will appreciate it and some may not. We found it to be a welcome change of pace and a great way to use up that extra tahini. In the bowl of a stand mixer fitted with the paddle attachment, beat on medium speed the butter, tahini, sugar, and brown sugar together until light, about 2 minutes. Add the egg and egg yolk, followed by the vanilla, and beat until incorporated, about another 30 seconds, scraping the sides and bottom of the mixing bowl as needed. In another bowl, stir together the flour, baking soda and salt. Add the flour mixture to the stand mixer and beat on low speed until it all comes together and forms a soft dough. Add the chocolate chunks and mix until combined. Cover the dough with plastic wrap and refrigerate at least 4 hours, or overnight. Preheat oven to 325 degrees. Line two baking sheets with parchment paper. Using a medium cookie scoop, portion the dough onto the sheet pan, leaving ample room for the cookies to spread (I only put about 8 cookies per pan, rather than 12, to allow for spreading). Bake the cookies 11 minutes, for gooey centers or 12-13 minutes for crunchier, chewier cookies. Allow the cookies to rest on the pan for 5 minutes before transferring to a cooling rack. Repeat with remaining dough (or cover and refrigerate remaining dough to bake later). Recipe adapted from David Lebovitz. 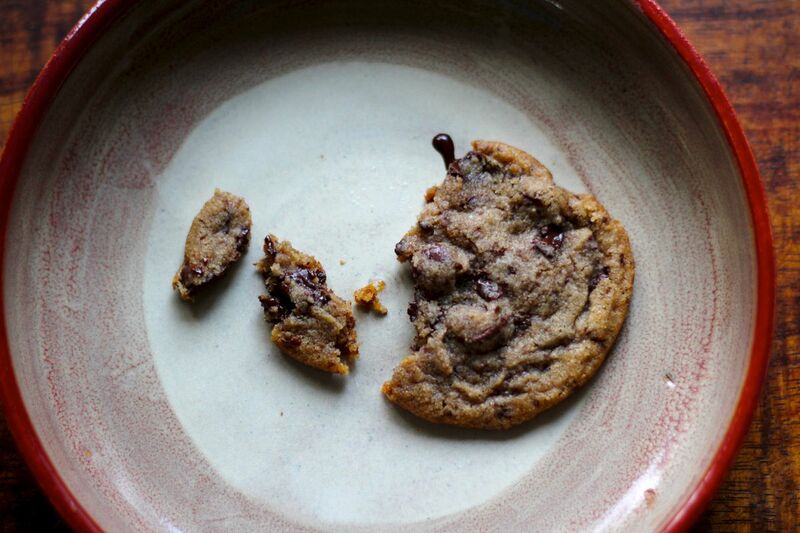 Note: David Lebovitz suggests sprinkling flaky sea salt, like Maldon, on the cookies prior to baking. If you decide to give that a try, I recommend swapping out the salted butter for unsalted.